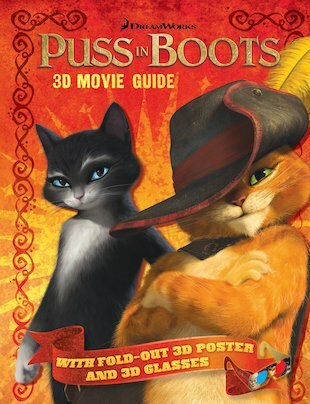 The purr-fect movie guide – with 3D images throughout. You won’t believe your eyes! Having proved himself a loyal friend and dangerous enemy in the Shrek movies, now that cheeky, charming Puss is back in a prequel movie of his own. Follow him as he battles to save the world from a dangerous ancient force, aided by Humpty Dumpty… and shadowed by Kitty Softpaws, a slinky black glamour puss who quickly steals his heart! As this feline bandit reaches dizzy new heights of swashbuckling naughtiness, see every bit of the action in this stunning book of 3D pictures! Includes 3D glasses and poster.